Come join us for a weekend of self-care and rejuvenation for both body and mind! We will start each morning with ancient Buddhist meditation focusing on the aspect of love & compassion, and yoga asana then move into one of the most beautiful texts from India, The Wise Woman Sutra, dating back some 2000 years ago. We will explore this hauntingly beautiful conversation between the Buddha and a passionate woman on the importance of taking care of ourselves and others in order to develop an open heart & live with happiness. We will end our days singing to experience another tool to open our heart with chants and songs of devotion. Teachings will be in English with translation in French. Mercedes Bahleda is a popular singer and scholar from New York City who has spent the last seventeen years studying both the Yogic Lineage and Classical Buddhism in the great monasteries and ashrams of the West and India. She has spent over a year combined in deep solitary meditation retreat in the wilderness of the Arizona desert. Mercedes is an honors graduate of New York University is signed with White Swan Records. ￼￼Cécile Roubaud: After many years studying the body through dancing, Cécile started her Yoga journey with Hatha Yoga in 2002 in Paris. As she discovered Ashtanga Yoga, a few years later in Mexico, she got passionate about it, which led her to cross the world to learn more about it. Since 2009 she is as well exploring the benefits of Yin Yoga that she discovered in Canada with Bernie Clark. Cécile is 500 -RYT certified and offers continuing education and teacher training of Yin Yoga around the world.Her sources of inspiration are mainly: Biff Mithoefer, Bernie Clark, Paul and Suzee Grilley, Shiva Rea, and Geshe Michael Roach. 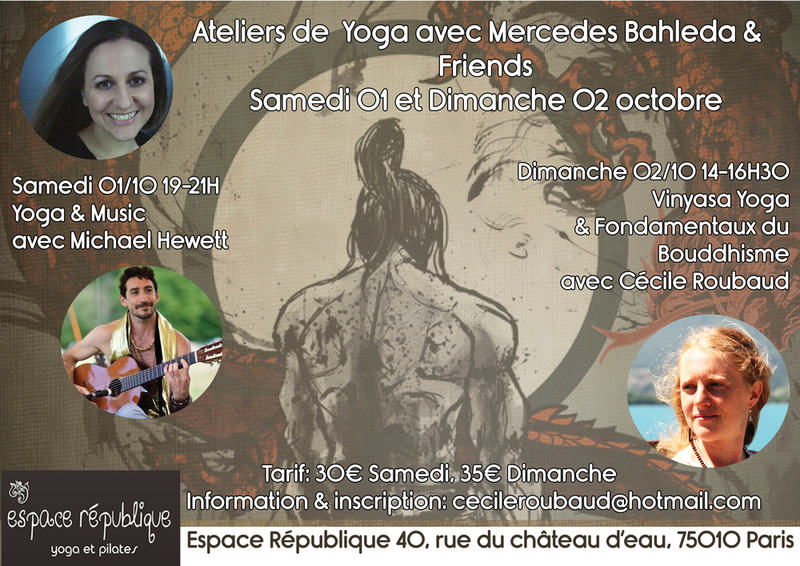 Cécile is passionate about passing on her knowledge gained from studying with worldly renowned yoga masters. She is dedicated to her students, helping them dis- cover their own great potential and power. «Discover the amazing taste for delicious vegetarian meals. Amélie is a very creative chef and follow the season to prepare meals adapted to the season. Some karma works will be proposed to help in the kitchen if you wish to learn some of her secrets! Early birds (before 10th of September 17) : 350€ /400€ after Limited spots. Transport is not included. Teachings from the Wise Woman Sutra, Part 1 & 2 April 1st and 8th in Prescott, Arizona. OSLO, NORWAY- EMILY- Work in Progress. This evening will be a look at an excerpt of a new work with music, poetry and dance about the life and wild heart of American poet Emily Dickinson.